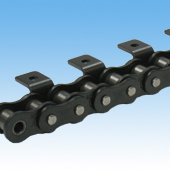 KF Series Lambda Double Pitch Chain combines our previous heat resistant Lambda Chain with our previous food grade Lambda Chain. Uses a special lubricant that does not volatize or degrade in high temperature environments (150°C to 230°C) for maximum wear resistance in high temperatures. Uses an eco-friendly NSF-H1 grade certified oil for use on food equipment. Uses an eco-friendly NSF-H1 grade certified oil for use on food equipment. Provides stable lubrication and wear resistance in temperatures ranging from -10°C to 230°C.